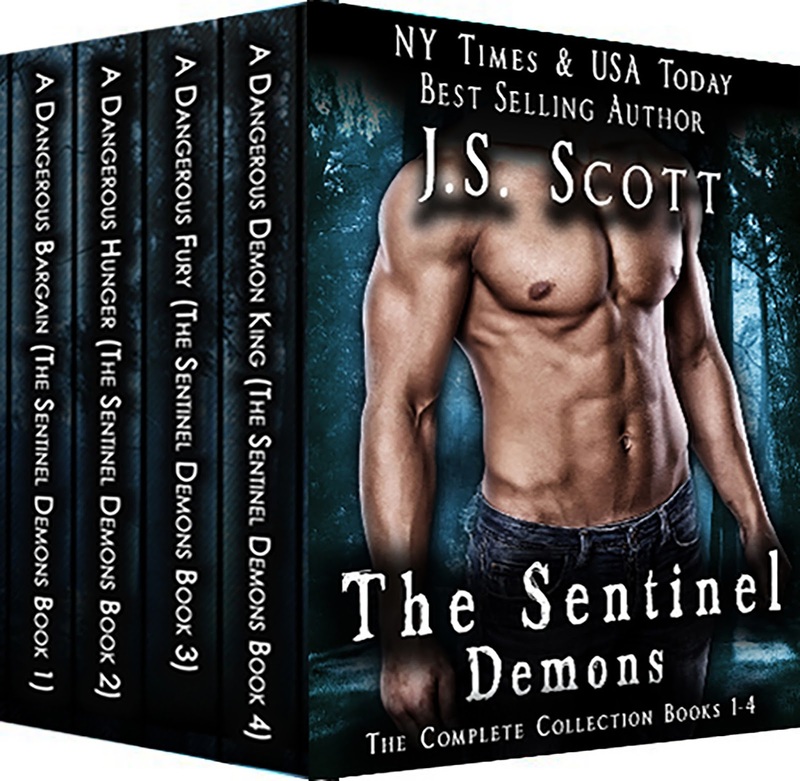 This boxed set of The Sentinel Demons includes all four books in this series PLUS a bonus book from the Vampire Coalition series, Ethan’s Mate. These paranormal romances contain graphic language, steamy love scenes, and lovable alpha males that also happen to be demons. A Dangerous Bargain: Kat Larson is haunted by demons. Literally. And how was she to know that there was more than one type of demon? The Evils want to destroy her soul, while handsome billionaire Sentinel demon, Zachary Winston, claims that he wants to protect her. Kat opts for Zach’s protection but it requires a demon bargain and what he suggests surprises poor Kat almost as much as the fact that demons really do exist. Zach must protect Kat from the Evils that will corrupt her soul. She is his “radiant,” the one woman who can lighten the darkness of his demon existence and be his eternal mate. Zach also has to fight an internal war. He’s one-part demon, one-part man, but they both yearn for Kat’s lush, full figured body and kind, compassionate heart. As Zach becomes more and more enchanted with Kat, he’s hoping she can learn to love a lonely man/demon that’s only slightly wicked. A Dangerous Hunger: Dr. Talia Maris had lived her entire life as a freak—a too tall, too plain, too odd woman who sees and senses the presence of otherworldly entities. A total recluse, Talia spends all of her time on her research with only her loyal feline companion for company. Until that sedate existence comes crashing down around her when she starts being pursued by demon Evils. And if there’s one thing she hates…it’s demons. She ditches every one of them until tall, handsome Sentinel demon, Drew Winston, finally wins the game of pursuit by trapping her with a deceitful, underhanded trick. Not only is she infuriated by Drew’s stunt, but when he tells her that she is his mate, all she wants is to get rid of Drew as quickly as possible! Drew had never wanted or expected a mate of his own, but once he has Talia in his grasp, he’s determined to keep her safe and make her want to stay with him forever. A Dangerous Fury: When Hunter Winston is sent on a mission to find a mysterious female who can help the Sentinels finally win their battle against the Evils, he’s not happy about the errand interrupting his constant compulsion to kill the red-eyed, ugly evil demons. But he owes his brothers and their Sentinel king his life, so he hopes he can get the task done as soon as possible. But Hunter is about to discover that retrieving a single female can be very complicated when it is the goddess, Athena, who has been held prisoner for thousands of years. The time of the gods is long gone, and she’s ready to go to her final rest as soon as she knows the balance between good and evil is restored. Unfortunately, that isn’t what the Fates had planned for her. Can an angry Hunter and a virginal but powerful goddess embrace their destiny, or will the many forces working against them destroy their one shot at happiness? A Dangerous Demon King: Kristoff Agares, King of the Sentinels, is trapped in the realm of the Evils, close to death and powerless from the demon's physical and mental torture. He's barely hanging onto his sanity until he gets a telepathic message from a mystery woman who makes him want to survive, no matter what it takes. After being rescued by an elite group of Sentinels, Kristoff can't ignore his powerful longing to claim his mate; the mystery woman. She was captured by the Evils as a child, and held prisoner for over two centuries, until the Sentinels set her free. With the World in chaos, and the balance tipping almost irrevocably in the Evils favor, the last thing Kristoff thinks he needs is a radiant, a human mate who will lighten his soul. Kristoff fights an internal battle, a war between his wants and what's good for his mate. Will he be able to tell her about his past? If he does, will his radiant be willing to accept him after she learns the whole truth?